RSS feed is the best. Do you’ve any? Kindly permit me know so that I may subscribe. Thanks. I could not do without my washing machine, I love it. A Front loader that is very economical. Then again my ‘baby’dishwasher which has pride of place on my bench ( no room for one any where else) is used every day and I love it too. Not one for doing dishes it too gets a gold star! 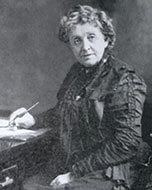 Thank God for women like Josephine Cochrane!